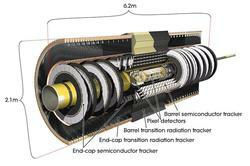 The DESY ATLAS group is involved in the operation of the current semiconductor detector (SCT) which is constructed out of 4088 silicon sensors with 768 strips each. Together with the Pixel detector and the Transition Radiation Tracker (TRT) it forms the Inner Detector (ID) which is measuring the momenta of charged particles produced in collisions. One institutional commitment of our group is the maintenance and development of the “calibration loop”: on a sub-sample of data important quantities, such like the noise occupancy of the sensors, the hit efficiency or the Lorentz angles, are measured. Those are uploaded to a central data base, and are then available for further analysis. A particular important task of this is the measurement of the noisy strips, which have to be identified within 48 hours after data taking, so they are masked during the full reconstruction. Further activities are studies of the non-collision beam induced background with the SCT, and the operation of SONAR which is a device to measure the coolant leakage from the Inner Detector. We also contribute to the Offline DQM shifts, the long-term monitoring, and the daily operation of the detector.